Activists for a universal basic income install a giant poster in a public square in Geneva, Switzerland, in May 2016, ahead of a referendum on the issue that failed. Photo via University of Toronto. We live in a society where people cannot access enough money to survive, and where economic inequality is so dire that the two richest Canadians own more wealth than the poorest 30 per cent of the country combined. The basic income debate is more pressing than ever; the government of Ontario recently announced that they would be introducing a provincial basic income pilot program over the next three years. 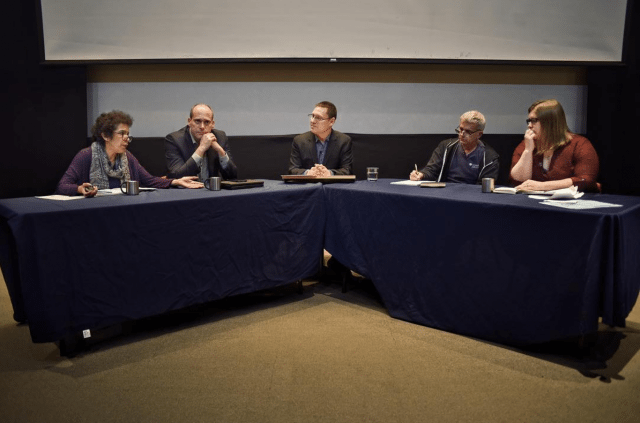 On Thursday, voices from across the left in Ontario came together at OISE to discuss how basic income fits into the landscape of the Canadian left. The event was co-hosted by a number of anti-poverty and activist organizations and moderated by Avi Lewis, co-author of the progressive Leap Manifesto. In an interactive debate, two speakers for and against considered the role of basic income in Canada’s future. For some—like Guy Caron—it’s a start. Caron is a leadership candidate for the NDP and has proposed a federal basic income policy designed to complement and augment existing social assistance programs. But to many in attendance, Caron’s proposal does not go far enough. “Basic income is a bandaid on a gaping wound,” said Jessica Sikora. Sikora is the president of Local 586 of the Ontario Public Service Employees Union. She was also one of the event’s most impassioned speakers, consistently receiving huge rounds of applause. Even the moderator agreed with the importance of pushing further. “We’re not really talking about change if we’re just helping people survive,” said Lewis. 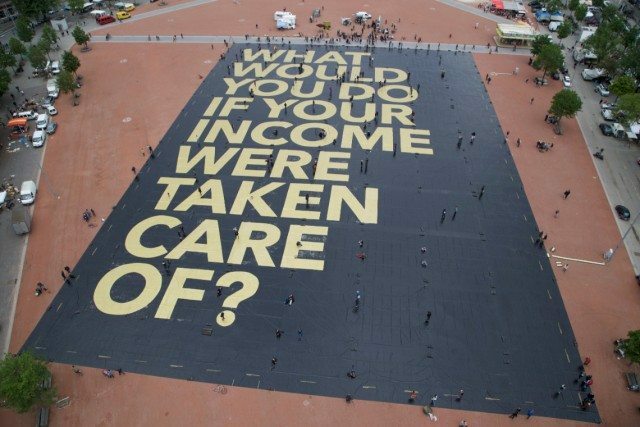 Sikora believes that growing interest in basic income may come at the expense of pressuring governments and employers to improve existing welfare systems and raise wages. She argued that we ought not to see this struggle in a vacuum. Josephine Grey of Low Income Families Together, NDP MP Guy Caron, moderator Avi Lewis, John Clarke from Ontario Coalition Against Poverty, and Jessica Sikora, OPSEU Local 586. Photo via Instagram. Movements like the Fight for $15 and Fairness, which demands a provincial minimum wage of $15 and guaranteed workers’ rights, are gaining ground in other provinces and among the NDP. Sikora believes that by proposing basic income, the Ontario government may be attempting to release some political pressure without capitulating to the movement’s concrete demands. She isn’t alone in this concern. Even those in favour of basic income acknowledge that provincial governments have a history of side-stepping activism through drawn-out consultations that end in broken promises for their poorest constituents. Around one-third of Ontario workers are low-wage, while the government has cut over $7 billion from public services since 2010. John Clarke of the Ontario Coalition Against Poverty is especially worried over what kind of program basic income would be—and whether we ought to trust it. “Income support programs have always been set as low as possible as reluctant concessions from the state,” he said, adding that this minimum helps enshrine an element of “coercion” into the economy, ensuring that poor folks remain tied to low-paying jobs. The Ontario plan is designed to stop short of covering all monthly expenses, only providing 75 per cent of the province’s low-income threshold and leaving the remaining 25 per cent up to recipients to scratch together every month. In an urban environment like Toronto, where income inequality has led to drastic levels of stratification [PDF], those numbers point to an utterly unaffordable downtown core [PDF], pushing low-income people out to the very edges of the city. Because it would essentially operate as a wage top-up, Clarke and his fellows at OCAP worry that basic income would leave more disabled and poor people dealing with employers unwilling to offer basic benefits. “We should be fighting for maximum worker control,” he said. In this context, Clarke argued, governments with austerity agendas propose projects like basic income in order to rationalize low wages and low rates for social services. Sikora believes that by relying on programs that do nothing to enhance bargaining power, improve wages, or entrench services for workers, basic income may be giving governments and bosses a “pass” to deny them what they deserve. “There was a time that a working wage was a living wage,” she said, to a round of thunderous applause. The Ontario plan attempts to do away with existing social services like the Ontario Disability Support Program and Ontario Works. Many anti-poverty activists, regardless of their stance on basic income, object to the low pay rates and high bureaucratic obstacles that characterize these programs. Those obstacles are part of what makes welfare so unfairly stigmatized in the public imagination. They also make it difficult to accumulate and save enough to gain a solid foundation, encourage predatory and underpaying work, and often force women into unsafe situations. Josephine Grey, a human rights activist and founder of Low Income Families of Toronto, was quick to criticize the Ontario government’s proposal as inadequate and untrustworthy. At the same time, she views basic income as a powerful tool within a larger toolkit for fighting poverty where the current system falls short. When we spoke, Grey explained what she believes to be the environmental argument for basic income. By ensuring that poor people of all walks of life have some income they can rely on, basic income constitutes a powerful first step towards restructuring our economy for sustainability. “We have to adapt and transition so many things so quickly if we’re going to survive,” she said. “There’s no way that we can do that if we don’t have a universal program that allows people to change the way they make a living.” Basic income, therefore, provides the autonomy and security required for people to develop adaptations and communities geared for environmental sustainability. Basic income should not be seen as a silver bullet. But, as Grey argues, it puts some power back in the hands of those who cannot fit within the framework of “working families” that other movements tend to emphasize. “I see it as a solid foundation for individual and collective economic security. I see it as an income system that would no longer create paper tigers to chase you through jungles of red tape,” she said. As she explained, the appeal of basic income is that it allows those who are unable to work and who are in precarious situations to make choices for their futures without worrying about their immediate survival. But the main point, as Caron emphasized, was that we ought to recognize basic income as a foundation for building a more equitable society. “It’s not a choice of basic income or restructuring the economy—it’s both,” he said.